The Chesapeake Bay Retriever is a powerful dog breed with a strong and muscular body. The Chesapeake Bay Retriever makes a good waterfowl hunter because of its extraordinary swimming ability combined with its strong yet tender bite, enabling it to carry birds under adverse conditions like strong tides and rough water. The Chesapeake Bay Retriever originated in the United States. Male Chesapeake Bay Retrievers range from 23 inches to 26 inches. Female Chesapeake Bay Retrievers range from 21 inches to 24 inches. Male Chesapeake Bay Retrievers range from 65 to 80 pounds. Female Chesapeake Bay Retrievers range from 55 to 70 pounds. 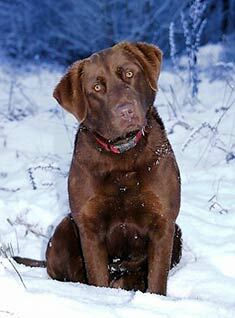 Chesapeake Bay Retrievers are typically brown, tan or sedge. Chesapeake Bay Retrievers have a water-resistant double coat with a harsh outer coat and a wooly undercoat. This dog breed's coat sheds and needs to be brushed a few times a week. The Chesapeake Bay Retriever is a protective dog breed who makes a good watchdog. Loving, affectionate and trainable the Chesapeake Bay Retriever makes a good family pet. 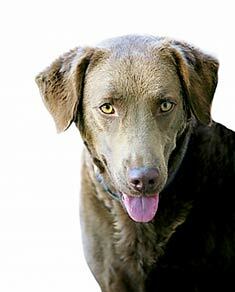 The Chesapeake Bay Retriever is susceptible to hereditary eye disease and hip dysplasia. The expected life span of the Chesapeake Bay Retriever is 10-13 years. Chesapeake Bay Retrievers are inactive indoors and will do best in a house with a fenced yard. This dog breed enjoys sleeping outdoors and prefers shaded areas. The Chesapeake Bay Retriever is in the Sporting group. with our Free Breeder search! Enter your 5 digit US Zip code or your 6-character Canadian Postal Code. Find Chesapeake Bay Retriever Puppies with our Free Breeder search! your 6-character Canadian Postal Code.